I always feel like a season of comfort food comes to a close when the warm winter coat comes off, the leg warmers get folded away and the boots make room for the open-toe pumps. As the colors at our local farmers’ market shift from earthy to vibrant, so do the colors on my family’s dinner plates. Emerald brothy soups replace ochre creamy stews, russet vegetable roasts make way for rainbow salads, and dry spices vacate the stage for green herbs. 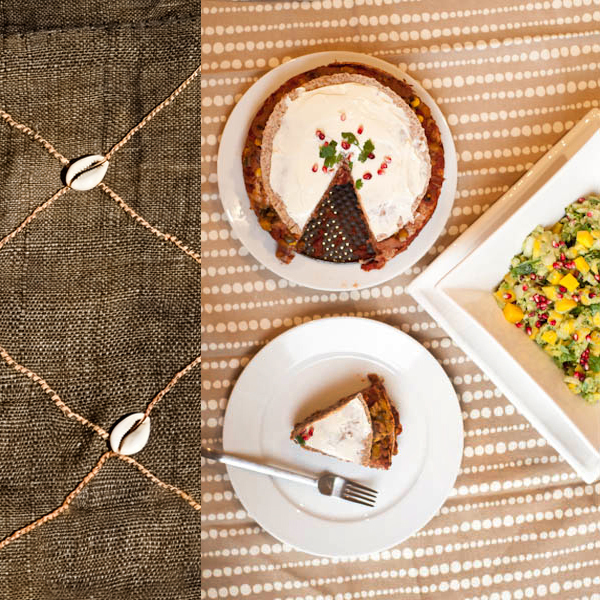 Today’s recipe of a warm and filling vegetarian Mexican Bean Torta is Cucee’s comfort food season finale. 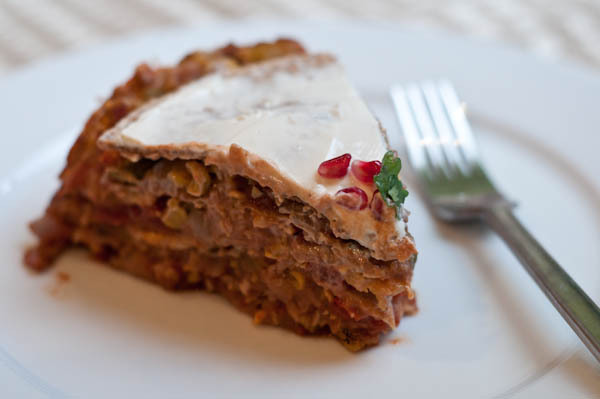 This wholesome layered tortilla cake, laced with chunky tomato bell pepper sauce and augmented with spiced pumpkins and creamy refried beans is my last cold-weather post. Heat the olive oil in a 3-quart pan over medium heat. Add the onion and peppers and sauté until soft, about 10 minutes. Add the remaining sauce ingredients and stir to combine. Simmer for 30 minutes, until thickened, stirring occasionally. Preheat the oven to 350F/180C. Chop the onion, capsicum and the pumpkin to the same size as a kernel of corn. In a large pan, saute the onion, capsicum, pumpkin and kaffir lime leaves in the chili oil for 5 minutes or until it begins to soften. Add the ground coriander, cumin, chipotle chili, chili powder, garlic, corn and 1/2 c water and continue to cook a further 5-10 minutes until the onion and pumpkin are almost completely cooked and the water has evaporated. Remove the kaffir lime leaves and set the pumpkin mixture aside. To assemble the torta, coat the bottom of a cake pan with 1 tablespoon of the sauce. Pour the remaining sauce onto a large bowl, bigger that the tortillas. Dip the first tortilla into the sauce, flipping to coat both sides. Place in the bottom of the cake pan and spread 1 tablespoon of the refried beans on top. Sprinkle over an even layer of the pumpkin mixture and top with a handful of cheese. Repeat for remaining layers and top with a generous helping of cheese. The number of layers (and number of tortillas used) may need to be adjusted depending on the height of the cake pan. In the middle of the torta, leave one tortilla dry – do not dip in the sauce – to soak up extra juices. Once finished, cover with tin foil before sliding into the hot oven. Bake for 20 minutes and remove the tin foil, baking for a further 15 until the cheese is melted and golden. If using a springform cake pan, let the torta cool before removing the rim, otherwise the filling will spill from between the layers. If using a normal cake pan, run a knife around the edges and turn upside down onto a platter once cooled (about 1.5 hours). 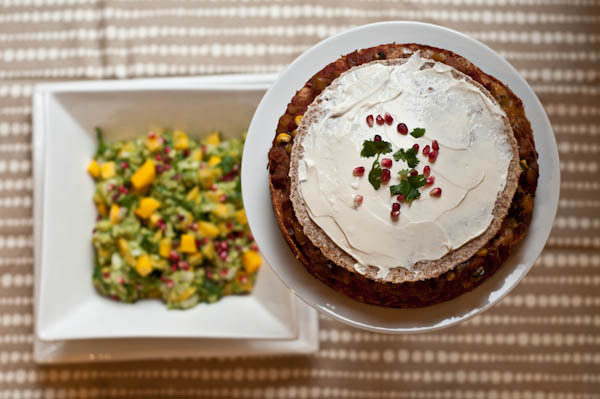 To finish, cover the top of the cake with sour cream and arrange slices of avocado, chopped tomato and coriander (cilantro). Serve cut into wedges with a section of fresh lime. A friend of mine who knows a lot about wine brought a bottle of Freemark Abbey Viognier 2009 and it really worked with the Torta. This medium bodied white wine is aromatic and fruity, making it a perfect pairing with this Mexican comfort food. Oh my. This looks absolutely fabulous. I would love to try this!